A Eurostar at Amsterdam Centraal. This is the very first public Eurostar arrived on 4 April 2018 with me on board - and in seat 61, of course. 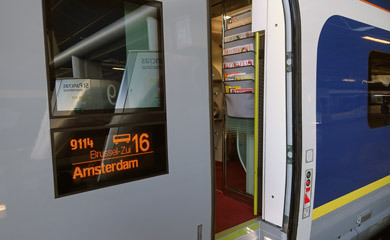 Eurostar's new e320 trains have the necessary signalling systems & electric traction voltages to operate to Amsterdam. For tickets between London & other destinations such as Utrecht, Den Haag. Leiden, Arnhem, Groningen, use www.b-europe.com. 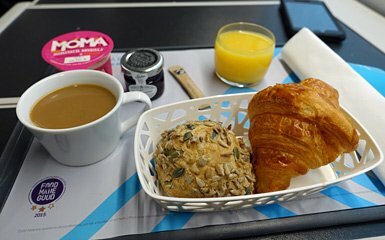 Eurostar now runs direct trains from London to Rotterdam & Amsterdam twice a day on weekdays, once a day at weekends, taking 3h55 to Amsterdam & 3h16 to Rotterdam. This new service started on 4 April 2018. The Man in Seat 61 says, "London to Amsterdam is one of the world's busiest air routes. 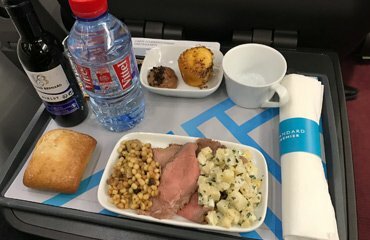 Eurostar is now running direct London-Amsterdam trains in an airline-competitive 3h55, city centre to city centre, hassle-free, with room to work, power sockets, free WiFi and (in 1st class) a meal & wine served at your seat. Eurostar has already captured 70% of the London-Paris market, and this new service is a game-changer for London-Amsterdam. It's taken a while to implement, but the wait has been worth it. And this is just the start." 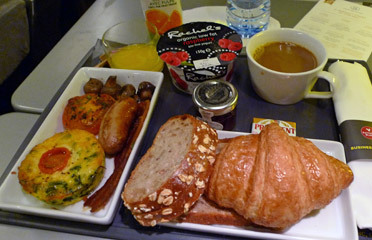 For Eurostar services from London to Amsterdam with a change at Brussels, click here. There is a 30-minute check-in at London St Pancras. London to Amsterdam is 581 km (361 miles). London to Rotterdam is 513 km (318 miles). Trains only operate in the London to Amsterdam direction, please read the important note under the timetable to understand why, and how you travel with a change in Brussels in the other (Amsterdam to London) direction. When the Dutch government formally approves passport control taking place in Amsterdam & Rotterdam from a date in late 2019 or early 2020 yet to be announced, Eurostar will open check-in facilities at Amsterdam & Rotterdam and you'll be able to board there and travel to London by direct Eurostar. Until then, direct Eurostars only operate in the outwards direction from London to Amsterdam. In the Amsterdam to London direction you must use a Thalys high-speed train from Amsterdam or Rotterdam to Brussels, then a Eurostar from Brussels to London, as shown in the Thalys + Eurostar timetable here. On the plus side, there is no check-in time to add for the Thalys, just board any time before departure, check-in for Eurostar is done in Brussels. 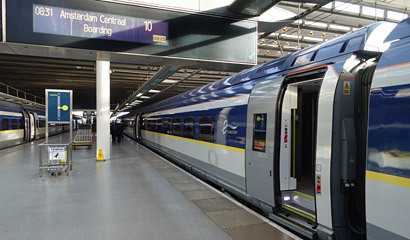 The London to Amsterdam Eurostar trains in fact return from Amsterdam to Brussels carrying Amsterdam-Brussels passengers, then they operate a Brussels-London service, but they don't carry Amsterdam to London passengers in this direction. Here's the reason: As it's not currently possible to check-in passengers at Amsterdam or Rotterdam, Netherlands to London passengers need to go through passport control & Channel Tunnel security checks in Brussels. 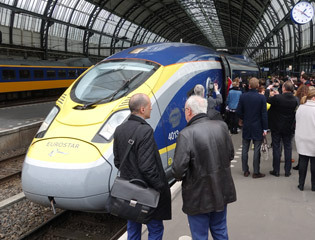 Eurostar has secured Amsterdam to London train paths with a 28 minute stop in Brussels. This is long enough for the train to be security-swept once the Amsterdam-Brussels passengers have got off to comply with Channel Tunnel regulations, but it's not long enough to de-train all the Amsterdam-London passengers, have them all passport-checked and security-cleared and get them back on the same train. So although these Eurostars are indeed running direct from Amsterdam to London carrying Amsterdam-Brussels and Brussels-London passengers, they are not currently able to carry any direct Amsterdam-London passengers. In this direction, passengers from Amsterdam & Rotterdam to London must use a Thalys+Eurostar combo as shown here until check-in facilities open in Amsterdam & Rotterdam in 2019. £35 one-way in Standard class. £79 one-way in Standard Premier with a light meal and wine included. 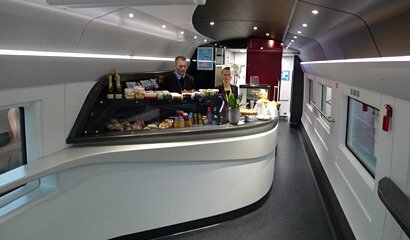 £260 one-way in Business Premier with a hot meal, wine & champagne included. Fares are dynamic like air fares, so book early for the cheapest prices and avoid busy days or dates. Buy tickets at www.eurostar.com. Booking opens up to 180 days ahead. You print your own ticket or can show it on your smartphone using the Eurostar app. 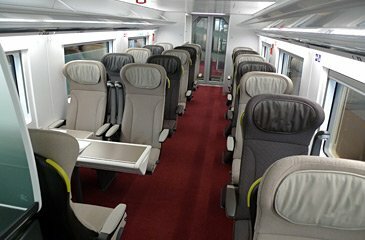 www.eurostar.com allows you to choose specific seats after payment, or you can use the Manage my booking feature to change your seats. 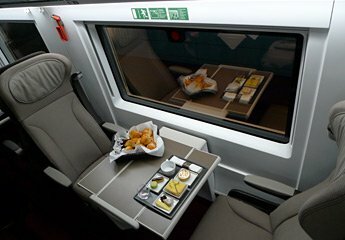 See Eurostar seat numbering plans & tips on choosing a seat - this route is always operated by an e320 as only e320s can operate into the Netherlands. It's possible to buy through tickets from 100+ UK towns & cities to Amsterdam, including Manchester, Leeds, Birmingham, Edinburgh, Glasgow, Reading, Oxford, Cambridge, Milton Keynes & so on. For example, Manchester depart 05:05, Leeds depart 05:05 or Birmingham depart 06:10, Amsterdam arrive 13:12. Start typing the station name into the journey planner at www.eurostar.com to see if your station is recognised. Eurostar have negotiated special rates with UK train operators for the domestic part of the journey. You can book from London to anywhere in the Netherlands via this new service using www.b-europe.com. One simple change at Rotterdam for Utrecht, Eindhoven, Den Haag, Leiden for example. Or change at Amsterdam for Groningen, for example. Eurostar plan to offer special fares from the UK to Any Dutch Station using these trains, changing to Dutch domestic trains at Rotterdam or Amsterdam, but they will only do so when the border control & security issues are resolved and passengers can start travelling from the Netherlands to London by direct Eurostar in the inwards as well as outwards direction. Details will be posted here as & when available. The morning Eurostar from London arrived at Amsterdam Centraal, 3h55 from central London. 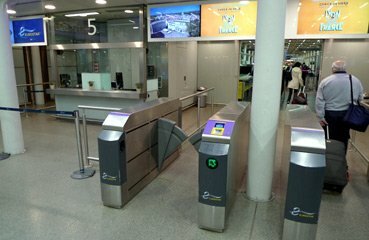 You must check-in at London St Pancras (or Ashford) at least 30 minutes before departure, simply by placing the barcode on your ticket over the barcode reader on the automatic ticket gates (pictured below left) or you can use the staffed kiosks (kiosk 5 is visible in the photo below left). Check in opens an hour or two before departure. This video shows the Eurostar check-in & boarding process. Immediately after the ticket gates there's a simple baggage X-ray and metal detector check, simpler than at airports, usually with no need to remove shoes or belts and no nonsense about liquids - although you can't carry an open cup of coffee through! In the return direction from Amsterdam & Rotterdam to London you'll be using a Thalys from Amsterdam or Rotterdam to Brussels. There is no check-in necessary in Rotterdam or Amsterdam, just board the Thalys any time before the doors close and it leaves. 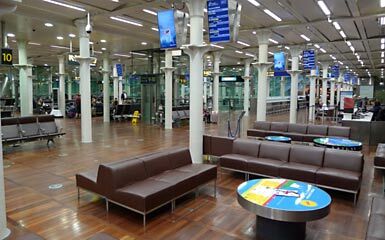 You get off at Brussels Midi and go to the Channel Terminal at the platform 1 end of the main concourse, where you go through the normal Eurostar check-in, passport & security checks to board a Eurostar for London. 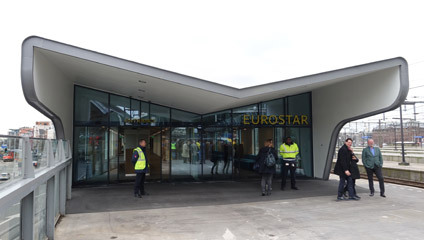 This is only temporary, Eurostar terminal facilities have been built in Rotterdam & Amsterdam and the Dutch government has committed to allowing Eurostar to check passengers in at Rotterdam & Amsterdam by the end of 2019 or earlier. 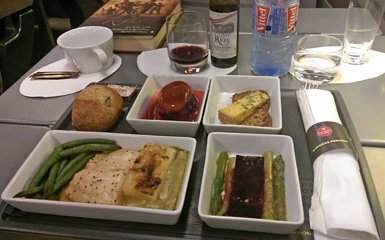 What's it like on board the Eurostar? 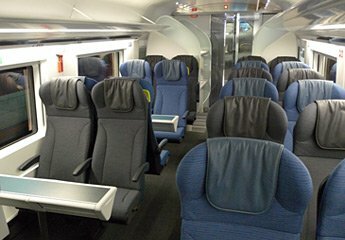 Eurostar has three classes, Standard, Standard Premier & Business Premier. See a full explanation of these classes here. You take your luggage with you onto the train and place it on the racks inside the entrance to each car or above your seat. 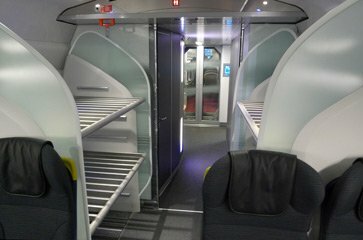 More about luggage on Eurostar. There's free WiFi in all classes, and free TV & movies to stream. All seats have power sockets, either UK 3-pin or European 2-pin type. Standard Premier & Business Premier seats also have USB charging ports. 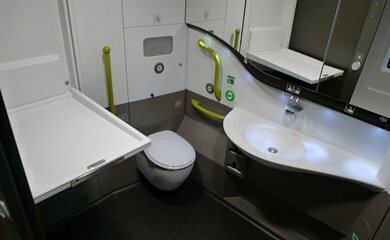 Eurostars have wheelchair spaces, accessible toilets, and toilets with baby-changing tables. There are two cafe-bars in cars 8 & 9 serving tea, coffee, soft drinks, wine, beer, champagne, sandwiches, snacks, and several hot dishes. All aboard for Rotterdam & Amsterdam! Plenty of luggage space at the end of each car. After leaving St Pancras the train tunnels through north London and emerges on the north bank of the Thames. Look out for the impressive QE2 road suspension bridge on your right, carrying the M25 across the Thames. The Eurostar then tunnels briefly under the Thames to reach Kent, speeding past Kentish woods and fields. The Eurostar crosses the River Medway on a high viaduct, on your left is the M2 motorway bridge but over the top of that you can make out Rochester Castle and Cathedral in the distance. On your right is the nicest view, the River Medway and its muddy banks dotted with small boats. The train passes Ashford station non-stop over a dramatic flyover and just half an hour from London it slows slightly and enters the Channel Tunnel. The tunnel transit takes just 20 minutes, but your phone reception and Eurostar's WiFi still work even deep under the Channel and regular Eurostar travellers hardly notice the tunnel these days. When you burst back into daylight, you're in France. You can just see the tower of Calais town hall on the skyline to your left as the train begins its race past the fields and villages of Northern France at 300 km/h, 186 mph. The lights of Lille Europe station flash past (the trains is non-stop to Brussels) and shortly afterwards it enters Belgium. The train stops at Brussels Midi for several minutes. The Eurostar speeds through Antwerp Central non-stop and crosses into the Netherlands, where there are several wide river crossings including the Moerdijk bridge over the Hollands Diep at the mouth of the River Maas. The train stops at Rotterdam Centraal then 40 minutes later rolls into Amsterdam Centraal, a mere stroll from Amsterdam's famous canals. Returning south across the Moerdijk Bridge over the Hollands Diep in early evening, between Rotterdam & Antwerp. 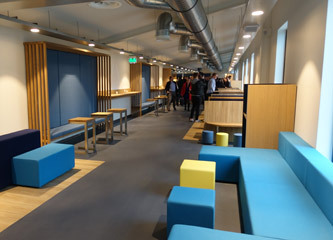 A new terminal has been completed at Amsterdam Centraal on the southeast end of platform 15, although this will only come into use when the border control issues are resolved and passengers can be checked in at Amsterdam, from a date to be announced in 2019. A similar terminal is being built on platform 1 at Rotterdam Central. In the meantime of course, in the UK-bound direction you board a Thalys train to Brussels with no check-in necessary at Amsterdam, check-in for Eurostar takes place at Brussels Midi. The SS Rotterdam: Easily the most original place to stay in Rotterdam is aboard the moored 1959 transatlantic liner, the SS Rotterdam. It's a taxi ride or 50 minute walk from Rotterdam Centraal Station.